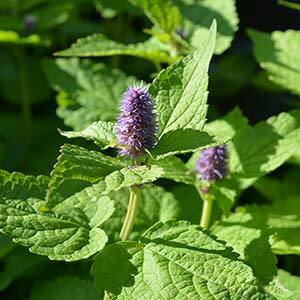 Also known as Golden Hummingbird Mint, Agastache foeniculum aurea is grown for the foliage as well as the flowers. Best described as lime green although Chartreuse is probably more descriptive, the foliage is fragrant when brushed against or crushed. Flowers are Lavender in colour and very attractive to bees and birds. A. foeniculum is the most widely grown species, characterise by blue flowers that appear in late summer, most varieties will reach around 1 metre in height. Any soil that is free draining seems suitable, a little added compost will be beneficial for growth, although overly rich and fertile soils are not the best for growing any of these plants. They prefer soils that are a little on the poor side. Once established Agastache foeniculum aurea requires very little care and virtually no extra water even in our dry summers. We do mulch around the plant to help maintain a little moisture, and we prune back hard in winter to reinvigorate the plant. Some varieties are short lived, and this is a part of growing these wonderful plants, enjoy the flowers and fragrant foliage while they are thriving, once the plants get old, replace them. The foliage of this drought tolerant plant makes it an excellent backdrop for many others. These are also a plant for the sensory garden, try growing them where they will be brushed against, the scent released is has an aniseed or licorice fragrance and is pleasant. Mix it in with Larkspur or any of the Catmints, ( Nepata species). One of the best foliage plants in the genus. Height – Will reach around 8ocm to 1.m in height. Spread – Over time will spread to .8m. Growth rate – Regarded as having a moderate to fast growth rate. Drought tolerance – Very good drought tolerance. Foliage – Lime green with a string mint fragrance. Container growing – Agastache foeniculum aurea grows well in containers.